She's the one who brought magic into your life, so give the gift that will bring some to hers. Our experts have designed this stunning bouquet of passionate red roses and dazzling Asiatic lilies surrounded in a cloud of lavender ribbon as a reminder of the tender moments you've shared. 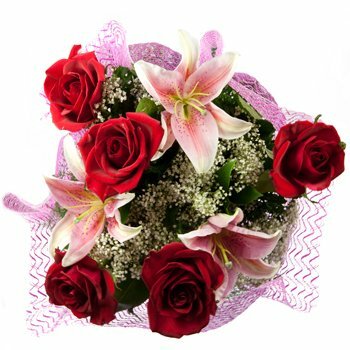 Perfect for romantic occasions, ideal for anniversaries, and a great gift on birthdays give your loved one the Magical Moments Bouquet anytime you want to tell her you care.